You don’t have to go to the Dissection workshop or be an FHT member to go the Bodyworlds exhibition. It’s just a good opportunity to join a group outing and enjoy the company and reduced price of a group ticket. If there’s 10 people interested in going to Bodyworlds on one of the days we’d arrange a group entrance £22 per person. We all have to enter together but can separate once we’re inside so you can take your time as you prefer. There’s a limit on the size of the bag (30cm x 30cm) you can take in, but there are (shareable) lockers to hire for 3 (I think) hours – bearing in mind we’ll have overnight bags. No photos allowed in the exhibition. I went to Bodyworlds in London last year (and some of us went in a group to Manchester a few years ago) and it’s an absolutely unique experience and very useful for our learning of the wonders of the human body. So far three members who are going to the Dissection workshop prefer to go to Bodyworlds on Thursday and three on Saturday – but the three Thursday people are also able to go on Saturday. It wouldn’t be possible to do both the workshop and Bodyworlds on the same day – just in case you were wondering…..Quite apart from brain overload!! I’ve set up a What’s App group for these trips so people can liaise with each other to share accommodation and/or travel together. Please contact us (info@fhtnottinghamlsg.org.uk) if you want to join us on either of the Bodyworlds trips. Categories: Event, News | Permalink. So far there’s 6 members who have booked to go on the Dissection workshop. Afterwards, you are free to enjoy the Gordon Museum which is a large, on-site pathology museum with approximately 8,000 specimens, used by the students studying medicine at Kings College London. The museum is not open to members of the public so this is a fantastic opportunity to explore their pathology collection after your workshop. The purpose of the dissection workshop is to provide you with an opportunity to see the structures that you massage on a daily basis as a therapist. There is no cutting – all specimens have been prepared for us in advance by the dissection technicians. These are in the form of ‘prosections’ (whole upper or lower limbs or torsos) and ‘pots’ (specimens held in liquid inside glass jars called pots). **You’ll need to book your own place on the Dissection workshop and your travel/accommodation. The group is a maximum 30 and over half the places are now booked. There’s a £10 saving for the Early Bird price of £135 – not sure when that expires. I’ve set up a What’s App group for these trips so people can liaise with each other to share accommodation and/or travel together. Please let us know (info@fhtnottinghamlsg.org.uk) if you’d like to join this WA group. 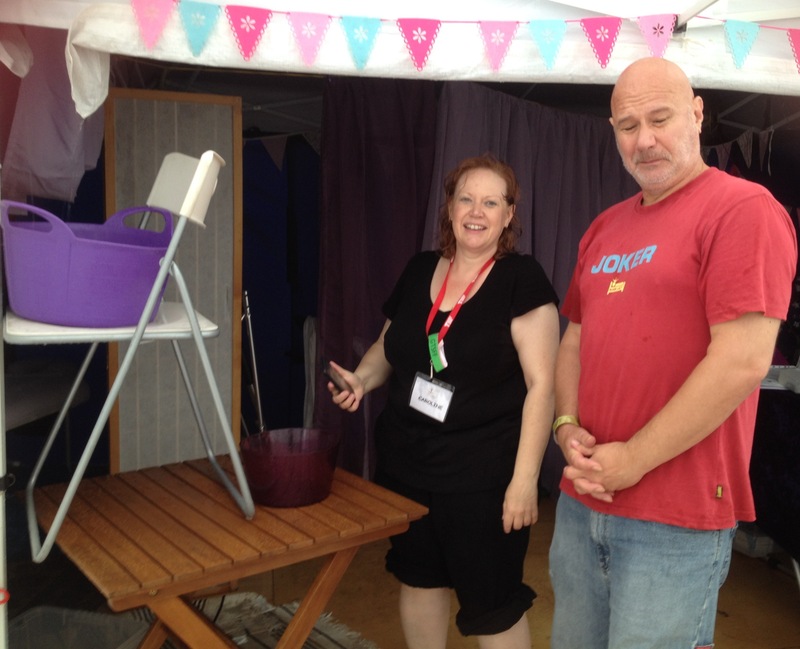 Well, yet again we had rainy weather for the Chill Out Zone at this year’s 10th Anniversary Gate to Southwell Festival from 9th to 12th June! 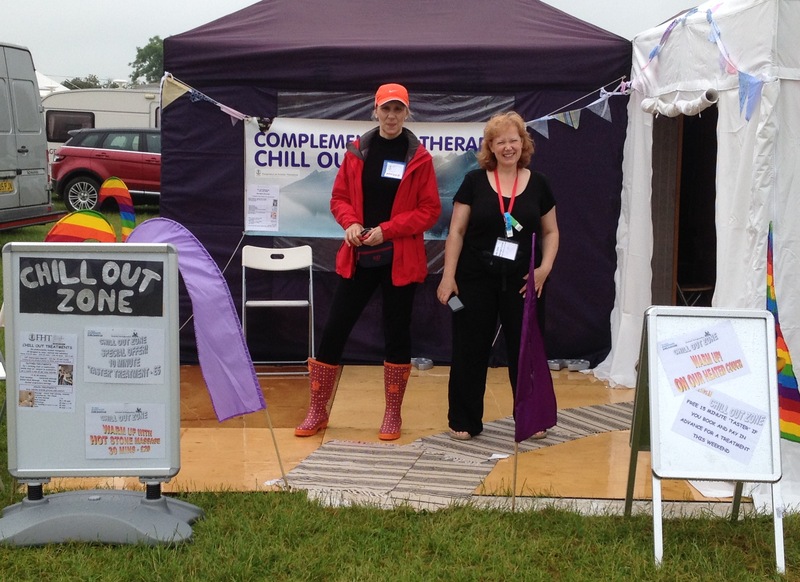 Nevertheless our 8 therapists were pretty busy and it was an enjoyable weekend – promoting and delivering complimentary therapies….. and bailing out!! We (and our clients) still kept cosy in our heated gazebos. We welcomed some ‘old’ clients and many new, including some of the artists. 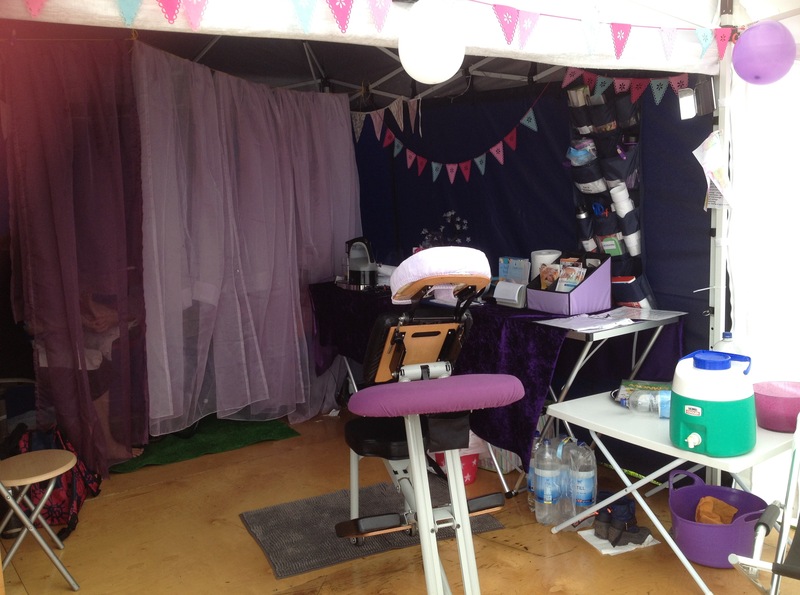 We did 49 treatments from free tasters to full hour’s treatments and had some lovely feedback. Bailing out Caroline with Keith Donnelly, one of the artists – our hero stayed for an hour to help!! 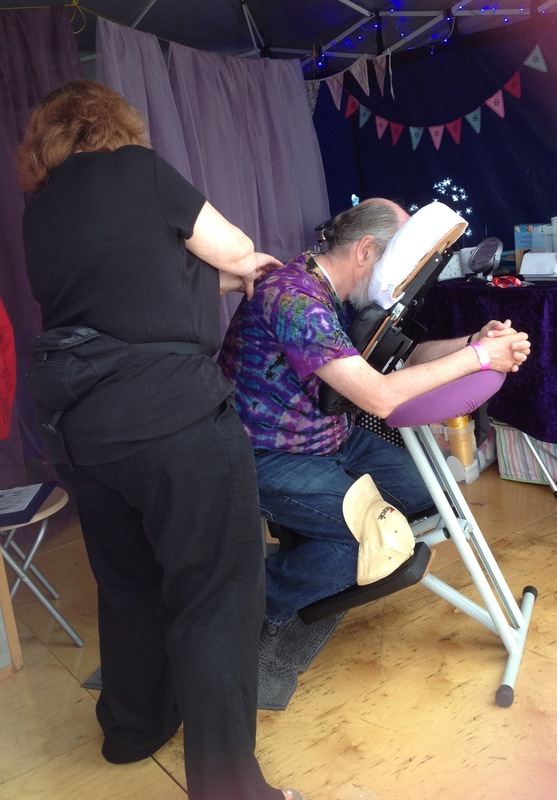 Louise Summerscales is qualified in Aromatherapy, Swedish Massage, Reflexology, Indian Head Massage,& is an instructor for “Baby & Infant Massage”. Louise will share a brief introduction & overview before giving a demonstration. Did you now that massaged babies develop more quickly physically & mentally; ie develop speech & social skills earlier, also more spatial awareness? Emotionally it’s incredibly therapeutic for both masseur & baby, it helps with such a variety of conditions with many benefits… short & longterm. There is a lot of scientific research & literary studies which highly praise this therapy. Infant massage is taught to parents. Throughout history, massage has been used by parents to soothe babies throughout all parts of the world. This talk & demo is open to everyone…come along to find out more.